AfterSchool Answers seeks to be a primary destination for support and enrichment of Out-of-School-Time professionals. Rick Rood began his work with children in 1987 as a music teacher for young children. Through the 1990’s he continued his work with children and music, additionally entering the field of School-Age Care. Through his small businesses, Music for Children and New Image West, Rick was exposed to business-model trainings and workshops. He immediately noticed a lack of business-quality trainings in the field of early- and school-age-education, and began grounding himself in the behavioral and motivational works cited and studied in the business world, so that he could bring the profound knowledge that was readily available in business-model trainings to the educational field. 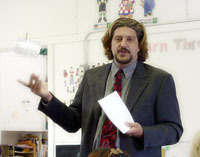 Rick began presenting his synthesized ideas at the California School-Age Consortium’s State Conference in 1999 in a staff motivation-and-retention workshop entitled “Burned Out or On Fire”. Since then, Rick has been presenting workshops and keynote addresses for a variety of statewide Educational organizations. Coming soon is an online board where AfterSchool professionals can connect and share ideas and inspiration!